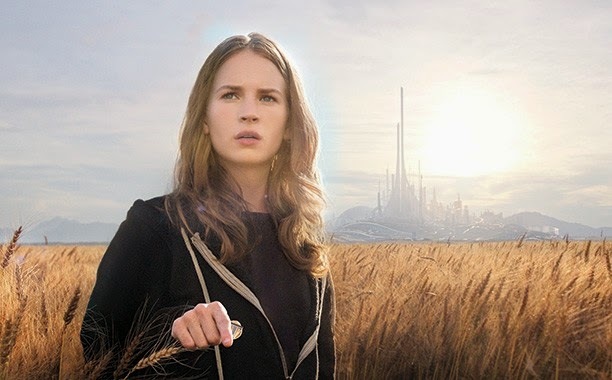 A week ago most people probably would have been hard-pressed to remember that Brad Bird's Tomorrowland, based loosely on the best section of the Disney theme parks, is an actual movie that will soon exist. There was a lot of hullabaloo when the movie was first announced, complete with a literal Mystery Box of items that sent the internet into a puzzle-solving frenzy to figure out exactly what this movie is all about anyway. Then, radio silence. I'm not sure what I love more, the idea of grumpy old George Clooney as a former science whiz-kid or the simple fact that Brad Bird, the man who gave us both The Incredibles and The Iron Giant, has made a live-action movie about a futuristic alternate reality. Sure the towering spires and jetpacks are fun, but my favorite thing about this trailer is the dead simple effect of Britt Robertson transitioning from world to world. It's so totally minimal and yet so completely effective. I was already damn excited about this movie, but now I am practically frothing at the mouth.